I am standing at the edge of a road overlooking a sea of blue buildings. The sight unfolding in front of me is ethereal. Beautiful blue painted buildings, an old temple complex and so many architectural details makes me stop my journey and get trigger happy with my camera. I am at Bundi, a small town in Rajasthan known for its miniature paintings and the 14th century Taragarh Fort that houses what can easily be called the best example of traditional murals and frescoes in the country. Situated about 35 km from Kota, Bundi is a town that is mostly off the tourist map which adds to its rustic charm. The drive to Bundi is scenic and quite green unlike the other parts of Rajasthan and surrounded by the Aravalli hills makes for a picturesque sight. I start exploring Bundi at the Bundi Palace where I meet with my guide Keshav Bhati who at 72 navigated the steep ramparts like a professional while I huffed and panted climbing the steep path behind him. The place was quite deserted and my guide tells me that Bundi came to the forefront in the 12th century. The Hathi Pol is the entrance to the Garh Palace and two trumpeting elephants on either side of the door in an arc shape welcome you inside. The palace has several buildings inside its sprawling precincts like the Hathi Pol, Deewan-e-Aam, Chattar Mahal, Phool Mahal and Badal Mahal. It is said that Chauhan nobles from Ajmer fought and got control over the Bundi area from the Mina and Bhil tribes and made it their capital calling it Hadoti. Bundi has a history of loyalty with the Mughals too. The highlight of the palace is the Chitrasala a picture gallery in Unmed Mahal built by Rao Unmed Singh. 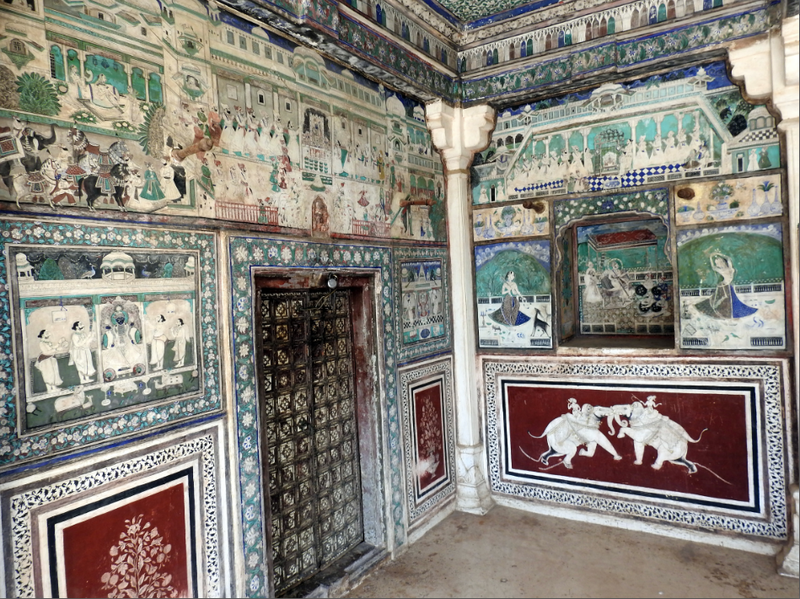 The walls have beautiful illustrations and themes in bright blue and green colours that my guide said signifies both Hindu and Muslim artists working together. The painting themes reflect Mughal and Mewar styles and include Lord Krishna lifting Mount Govardhan, Lord Rama’s marriage procession, musical melodies, love stories, court processions. All human figures are painted with white and red, blue, black and yellow are used for traditional dresses. These paintings have inspired an annual art event called Chitrashaala by Bangalore based fashion designer Deepika Govind and her husband Ashish Vohra. The views of the city from the palace are stunning. If you are able to trek up to the Taragarh Fort you can continue from here. The trek however is steep and the place is not well maintained so you must be prepared for the same. Bundi is known as the city of step wells and is said to have over 50 across the city. Originally meant to be a source of water, today most of them are in a state of disarray and not well maintained. The most famous one is the Rani ji Baori that has beautiful and intricate carvings. Built in 1699 by Rani Nathavatji, this is one of the largest examples of a stepwell in Rajasthan. Interestingly Bundi has an association with Rudyard Kipling who stayed in Bundi for some inspiration for his masterpiece, Kim. At the center of the city is the Nawal Sagar, a square-shaped artificial lake with several islets and a temple dedicated to Varuna, the God of water is half submerged in the middle of the lake. The Sukh Mahal a cream-coloured palace on the bank of the Jait Sagar Lake is where Kipling stayed and has a living area and dining hall on the lower level and two bedrooms on the next level. From here the views of the lake are stunning and will inspire you to write too! The Sar Bagh, an enclosed compound has several marble cenotaphs commemorating members of the royal family. If you love history and architectural sights, head to the Chaurasi Khambon ki Chattri a marquee supported by 84 pillars that was built in 1683 by Rao Anirudh Singh. Another stop while you are here must be at the Shikar Burj, a structure that the Rajputana kings used for hunting escapades that has a temple and is inhabited by monkeys. 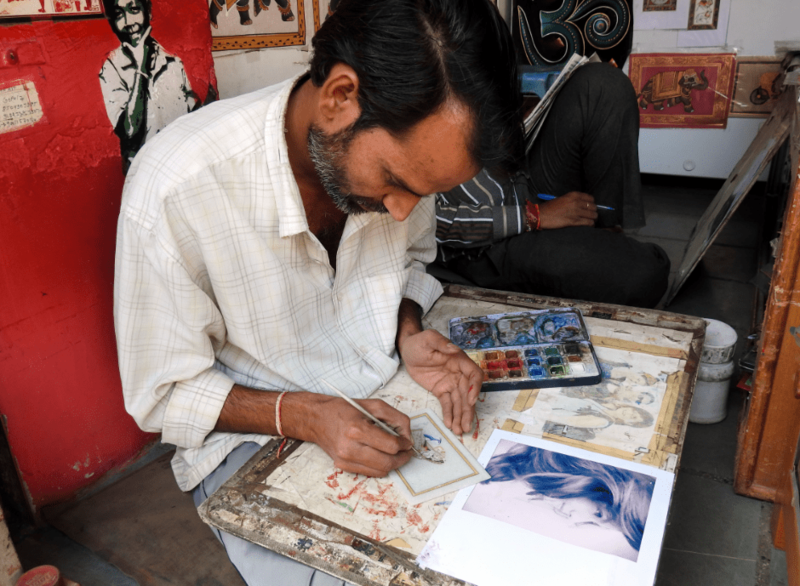 The best way to soak in the local culture of the place is to walk around the streets especially the one opposite the palace where you will meet local artists that demonstrate the fine art of miniature paintings. I met with a national award winning artist who was commissioned to design the cover of a travel book as well. The place however has several other artists from whom you can also buy some samples of the art painted on old stamp papers and postcards that make for excellent souvenirs too. You can also buy a range of local Rajasthan craft items here as well gem stone jewellery a speciality of the region. While you are here, do not forget to sample some authentic Rajasthani food and I recommend that you try the local Papad ki sabzi (a curry made with papad and gravy), Kadhi (a liquid curd and gram flour preparation) and Alu ki sabzi (potato vegetable). 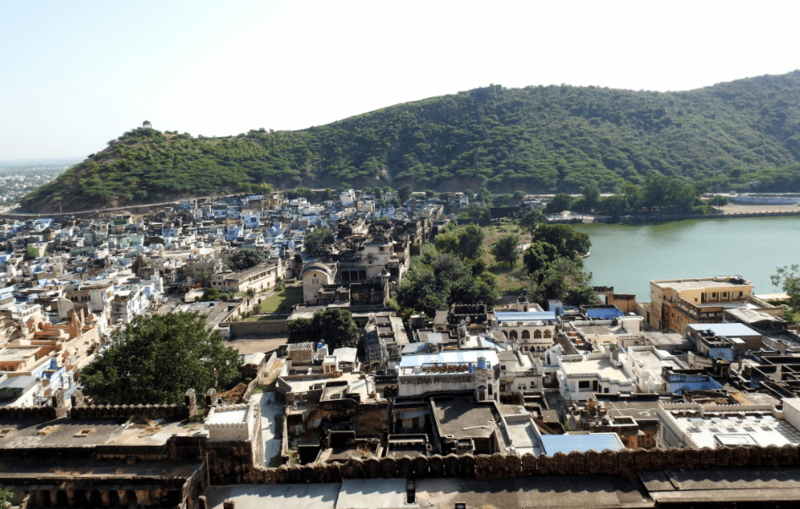 In all Bundi’s charm really lies in the fact that it is a small town that is off the tourist track and has many secrets up its sleeve that you can discover at your own pace. Reach: The nearest airports are at Jaipur and Udaipur and Kota Railway Station is the nearest railway station at a distance of 35 kilometres. Stay: There are several hotels on the street opposite to Bundi palace that have rooms facing the palace and roof top restaurants. This is where you will find Internet Cafes, souvenir shops, saloons, laundry stores, tour agents and even bicycles on rent. Eat: Continental food is available in the lane opposite to Bundi palace but do try the Dal Baati Churma near the bus stand. Try the samosa and onion kachori in the small streets of Bundi. Traveller Tips: Bundi is pretty hot for most of the year so make sure you carry water and protect yourself with a hat and sunscreen while touring the place. This story appeared in Deccan Herald’s Sunday Herald dated 22nd Oct 2017 here.